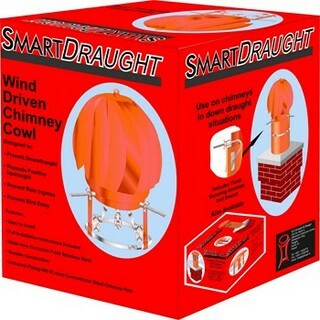 If you are having down draught issues with your chimney this H Cowl designed by I Q design might be the solution. 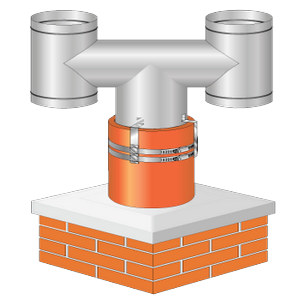 Fit easily within minutes, no tools are required to assist the fitting process you simply use adjustable toggle clamps to secure the H Cowl to the Chimney Pot. The H Cowl will prevent rain ingress and promote positive updraught. In normal or still air weather conditions the hot gases and smoke pass up the chimney and exit out of the top of both o of the vertical tubes. 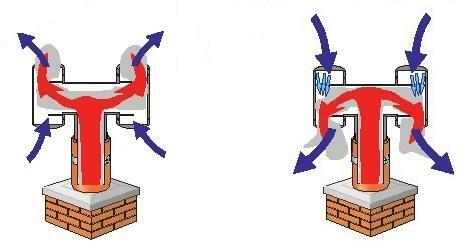 If wind drives downwards in turbulent weather conditions the air moving down the tubes induces suction as it passes the horizontal tube and the hot gases and smoke exit out of the bottom of the vertical tubes. Up to the 2015 winter season the H Cowl was only available in a terracotta colour finish but it is now available in four different colours. What is the Difference Between the H Cowl and the OH Cowl? If wind drives downwards in turbulent conditions, the air moving down the tubes increase in velocity because it is restricted as it is forced through a narrow gap as it passes over and around each end of the horizontal tubular section projecting half way into the vertical tubes. is there a H-Cowl solution for 2 opening from 2 fireplaces on one chimney? You can of course Desmond! As long is pot has an 8 inch internal diameter it will be fine. 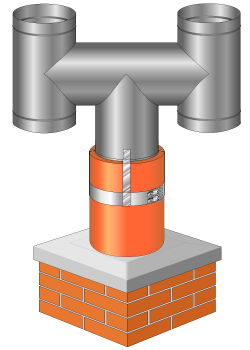 Our chimney has a 10.5″ outer diameter. We get serious down draught! Would you have a h cowl that May solve our problem and what price please? What is the inner diameter Clement. If it is greater than 8 inches we can get one custom made for you. It will cost about 40 euro extra though. Hi… I don’t know whether I need a H Cowl, OH Cowl or the spinning cowl… have terrible downdraught in windy conditions… cannot light the stove in this case… Chimney is stainless steel one off the stove- built to spec- right height etc, house is a bungalow… need to get this sorted as it is a waste. 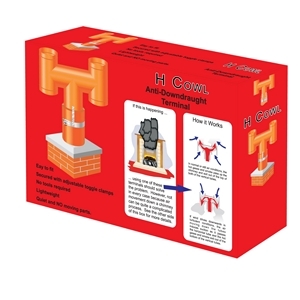 The H Cowl is especially designed to address down draught issues so it should help solve the problem. I have an oil converted Aga, hugh problem when there is an east wind, it almost goes out. Any thoughts? If doesn`t have huge downdraught problems, Storm Cowl will be perfect in this situation. Is round and will assist on wind redirection. If there are downdraught problems as well, H Cowl would be the best, but is a massive cowl and don`t know how will face to a strong wind. Still think that Storm Cowl could be the best solution. we have a stove & have had a spinning. Cowl which helped with lighting the fire with the updraught however its passed its best & we want to replace it with something similar but not a spinner as it keeps us awake at night. Any options? The best cowls for updraught are Spinning and H Cowls. Given the noise issues you have had with the spinning cowl I would suggest trying the H Cowl. I’ve a stove which has very little draw on calm days , we replaced our chimney flues recently with ceramic flues due to fire damage and my builder said that he installed a spinning cowl to address the draw issue. However , on calm days or until the fire is well lit opening the door will emit a lot of fumes from the stove . Is there any other cowl to help with this issue? I HAVE A STANDARD FLUE AND BURN COAL OR WOOD AND HAVE DOWN DRAUGHT WILL H COWL SOLVE THE PROBLEM. There can be no guarantees with anything but in 4 years selling H Cowls we have yet to find a customer dissatisfied with the product. 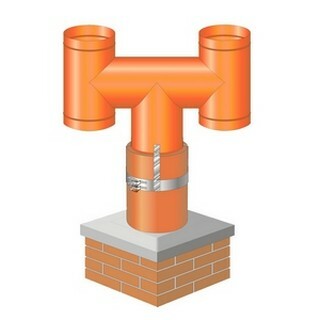 I have an octagon chimney pot, is it possible for the manufacturer to make a suitable fitting H-Cowl? What pot diameter (internal) is suitable for the ‘H’ pot? 8 Inch Internal pot Robert! If the issue is downdraught an OH Cowl is your best option. If it is an updraught issue then the H Cowl is best suited. Hi i have skme updraught problem. Will oh cowl fix this or have to get any other cowl. Every chimney is different but in general yes it will work. 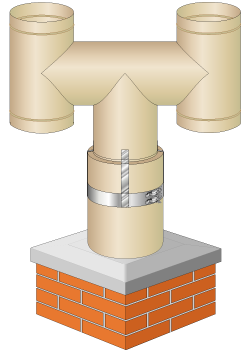 However if the chimney pot is lower than the nearby buildings or trees, won`t matter what type of cowl is used as you still won`t create enough up draught. In this situation only a chimney extender might solve the problem.